LEAP Sports > News > Shawlands Academy Creating Inclusive P.E. We want to wish the pupils from Shawlands Academy in Glasgow the very best of luck as they are shortlisted in the Youthbank Scotland Project of the Year award tonight for their work with LEAP Sports Scotland to create a new Manifesto for Inclusive Physical Education. 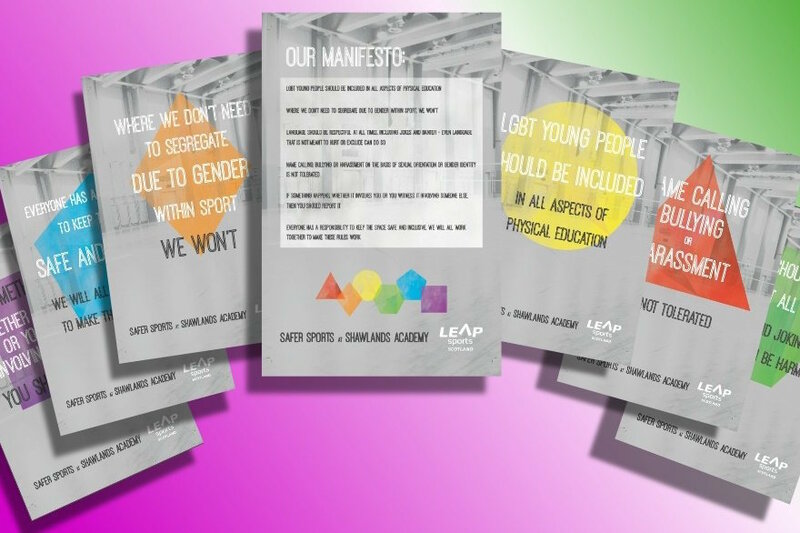 Following a year of working with LGBTI pupils in the school, Safer Sports at Shawlands Academy was developed as a Manifesto of commitments which the school’s Physical Education Department have agreed to, and are now in the process of implementing. The school have put the material on their website and it is now on display across the school. The young people then applied to Youthbank Scotland for some financial support to have their posters printed and displayed across the school. Further information will be available on the Manifesto via our website following a special launch event at Shawlands Academy next week. Written on 16th February 2017.